to accompany the team on field missions. Personal File: Former employee of Torchwood One in London, whose girlfriend, Lisa, has been partially converted into a Cyberman. First encounters Jack by helping him fight a Weevil. Ianto asks for a job, but is rejected by Jack after Ianto was found to have worked for Torchwood London. 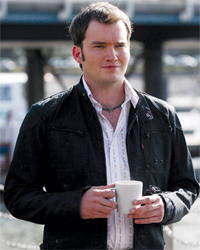 The next morning, Ianto gives Jack coffee as he exits the Hub. Jack recalls knowledge about Ianto, stating that he researched him after he was able to identify a Weevil. Ianto again asks for a job as his old job was lost when Torchwood One was destroyed, but Jack states that he had severed all ties with Torchwood One and refuses. That night, Ianto steps in front of the SUV, and once more asks for a job. After Jack threatens to run him down, Ianto explains he is pursuing a pterodactyl. After a long battle, the two manage to sedate the creature. Finding themselves pressed together on the ground, they experience a moment of sexual tension, before Ianto excuses himself. Jack tells Ianto that he expects to see him at work the following morning. Eventually, Jack and the team found out that Ianto has been keeping Lisa alive, concealed in the basement of the Hub, but she eventually breaks loose, and kills two civilians. Ianto is forced into confrontation with Jack, who is later able to revive Ianto with a kiss when Lisa knocks him unconscious. Ultimately, the rest of Ianto's team is forced to kill Lisa. Later Ianto begins to develop a sexual relationship with Jack. Ianto has a sister, Rhiannon, and a brother-in-law, Johnny Davies, a niece and a nephew.